When I first heard that Jackson was adapting the Hobbit into three movies, I have to admit I was filled with dread. How was he going to take a 300 page book and turn it into six to nine hours of film? When I watched the first movie, I was pleasantly surprised. The Tolkien purist in me was disturbed, but I had to admit it was nice seeing almost nothing cut from the original story. The pacing was slow, but I enjoyed it anyway. Yesterday I watched the second Hobbit movie. 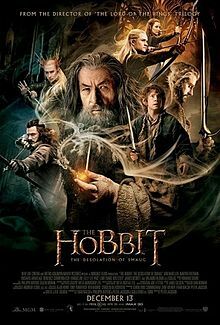 I generally enjoyed it, although I very much noticed how much this movie is Peter Jackson rather than J. R. R. Tolkien. Many story components from the novel were minimized, and aspects from the story either taken from the Lord of the Rings appendixes or simply made up by the movie producers were favored. In some cases, I think the changes were positive. The epic battle between the dwarves and the dragon was much better than the non-encounter of the novel; in many ways it did a better job of meeting the implied promise at the start of the story. The politics of Lake-town were much more developed than in the book. I like the addition and expanded role of Radagast. And the Legolas, Tauriel sub-plot, which I was prepared to hate, was actually rather enjoyable, largely I think because of Evangeline Lilly’s performance. But I was bugged by the minimization of the trip through Mirkwood. In some ways, I can understand why the producers minimized it, since much of the plot in the book ends up being a bit flighty. But that silliness applies to much of the Hobbit story overall, and is something that anyone making an adaptation of it needs to be prepared to embrace. I thought the first movie found the right balance of inclusion and minimization of these elements, but that this installment minimized it too aggressively. And while I was happy to see the Necromancer sequence getting fleshed out, since it was something only obliquely referred to in the novel, serving more as a mechanism to get Gandalf out of the story for a while than than as any kind of meaningful significant plot point, I’m not sure how I feel about Jackson explicitly showing an encounter with Sauron. Tolkien made a decision not to have us as readers ever directly encounter Sauron. Doing so kept him as a manifestation of the deepest fears of our imagination. I think Tolkien understood that any actual in person description of Sauron would have cheapened him, made him more approachable. By keeping him unseen as a manifestation of evil, as a nightmare that we’re never able to confront, Tolkien kept him more mysterious and dreadful. Jackson does his best to keep that dread and mystery, but ultimately any encounter with Sauron will cheapen him, make him more approachable. In the movie, he came across as a type of dark ghost to me more than as any kind of formidable dark lord. All that said, I did enjoy the movie. The visuals remain striking, and Jackson’s version of the story compelling. I’m looking forward to the final installment. This entry was posted in Zeitgeist and tagged Evangeline Lilly, Hobbit, J. R. R. Tolkien, Legolas, Lord of the Rings, Mirkwood, Sauron, Tauriel. Bookmark the permalink. I found it tedious. Way too much filler, especially regarding the elves, Laketown and the love interest between Tauriel and Kili. I didn’t find Evangeline Lily’s performance to be particularly good, but not bad either. The basic problem with this is the very concept of the film. Expanding the Hobbit out to three films was a bad idea from the start, but to do it as part of a series with The Lord of the Rings is also ill advised. The Lord of the Rings is an epic saga. The Hobbit is a children’s fairy tale. Trying to make The Hobbit fit tonally with The Lord of the Rings just doesn’t work. I suspect it could be done more successfully by making The Lord of the Rings more childish than by trying to make The Hobbit more serious. It was also weird to see an older Orlando Bloom playing a younger Legolas. It probably would have been better to leave him out of it. Ian McKellen didn’t bother me as much for some reason, and we didn’t see much of Cate Blanchett. I agree with you on several points. I think the first film balanced silliness with seriousness more successfully. I think it was good to include Radagast and to explore Gandalf’s mission to Dol Guldur, as this sets up Lord of the Rings nicely. I see your point about representing Sauron so directly, but personally I think it was defensible on the grounds that Sauron was still relatively weak at this point. Perhaps it is appropriate that he be more approachable. Also, we had previously seen him as a humanoid warrior in flashbacks, and in the legendarium of Middle Earth he had been relatively approachable in earlier epochs, appearing beautiful and generous. I didn’t feel it, but a lot of my friends agree with you on the tedium. I agree that attempting to keep the movie tonally matched with LOTR probably compromised it too much. Tolkien started to rewrite the Hobbit in the LOTR’s tone, but gave it up before getting very far. The books were just too different. That said, I have some sympathy for the producers on this since most of the audience has probably not read the books. My problem is not that it betrays the book, it’s that it’s trying to make a serious film out of source material that just isn’t designed for it. Imagine trying to make a dark, epic tale of heroic struggle out of a Winnie the Pooh book. I agree on the Winnie the Pooh idea! Have you ever read the comic Bone? It’s starts off somewhat Winnie the Pooh like and gradually evolves into an epic saga. Interesting observation about Sauron. It’s true that when we confront our fears and see what they really are, they turn out to be not such a big deal. The most scary is the formidable unknown “evil” lurking in the shadows. Perhaps, it’s the same deal as with “creating an image of God”. As for the movie, I did not like the fight part. It’s too long and too intense. It was like listening to a piano piece plaid fortissimo for 40 minutes or eating a super-spicy Thai dish where you stop feeling the taste. Thorin floating in a tin pan down a stream of molten gold was my “favorite”. I wonder, what’s left for the last movie. I thought, in the book, the dragon gets killed and that’s it, pretty much. Most likely, there will be a huge long epic fight with orcs. I think you’re right on the God comparison. I noticed that Tolkien almost never showed divine persons, except in disguise, as in the case of the wizards, or glancingly as in the case of the balrog. He does show them in the Silmarillion of course, but only in a remote legendary manner. There actually was a lot of story in the book after the dragon, but just in case you haven’t read it, I’ll omit the details.